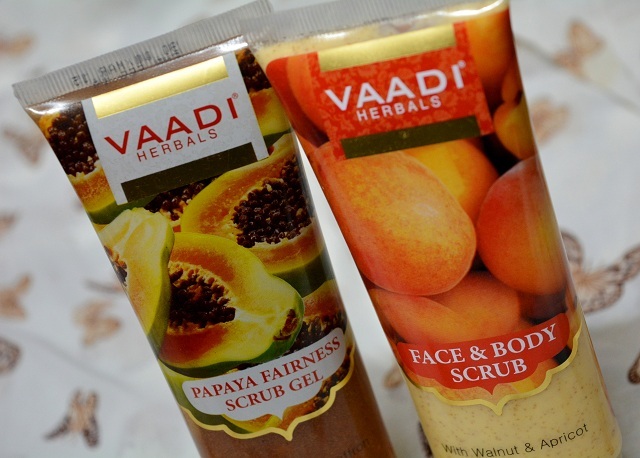 I will review 2 scrubs today and both are from Vaadi herbals. Lately, I have started liking their products. If you remember, I reviewed their face packs and they were really good. Today, I will put the spotlight on these 2 scrubs, one is a papaya fairness gel scrub gel another is a regular apricot walnut face and body scrub. Price: Both of these products are for 90 Bucks which is very reasonable for the quantities that are there in the individual packs. 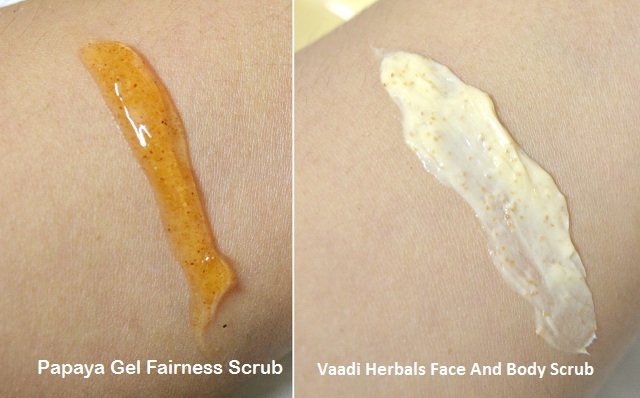 I like gel scrubs as they are lot more hydrating than the other forms of scrubs that are there. I have used one such scrub earlier but that had sticky texture to my liking. 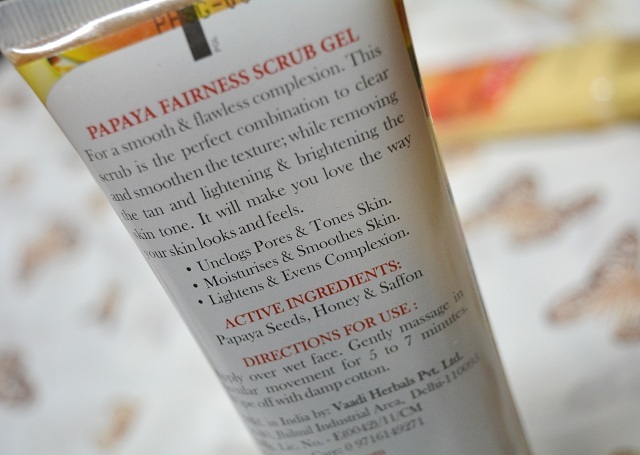 This papaya gel scrub claims to have papaya seeds, honey and saffron extracts in it. It claims that for smooth and flawless complexion the scrub should be used regularly. It takes off tanning and lightens the skin. While using this, I liked the texture of the product. The gel is a papaya smelling brownish yellow in color where there are fine particles which are not too dense or very scatteredly suspended in the gel. It really helps to exfoliate the skin thoroughly and the gel provides the hydration while I am using this. The gel texture also gives lubrication thus make the process gentle and nothing that will scratch or irritate the skin. This is why I think this will be great for the oily to sensitive to dry skin. I have used the regular apricot and walnut scrubs so this gel scrub was better and something that I would prefer over the regular scrubs. I will recommend that you should try it. This scrub is a regular scrub that can be used on the face and body as well. The particles are decently sized and not too densely packed. I like using this for the body as I am using the papaya gel scrub for the face. As a body scrub this is not expensive and does the job of thorough exfoliation really well. This is not as hydrating as the gel one therefore good for the body. The particle are not too big in size hence those of you with sensitive body skin can also use this. If you’re using a body scrub then 2-3 times a week is a good time to do that. Remember to give more attention on the parts like heels, knees, elbows and back of the neck as they tend to accumulate dead skin quicker and gets thicker. Exfoliation will help keep them smoother. 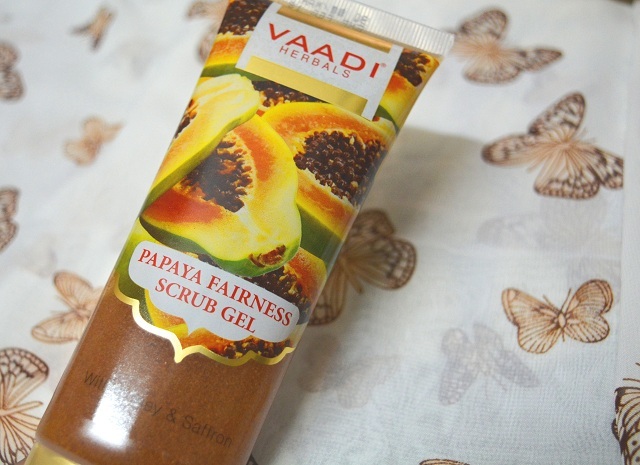 So, overall I like both these scrubs by Vaadi herbals but I will recommend that you should try the Papaya gel fairness scrub; I loved it and hope you will also like it but don’t really go with the fairness tag. But you may take it as like when you regularly scrub the face, it helps to remove the dead cells and gradually skin texture enhances as a result of which skin appears lighter.